Today we are going to discuss about the last type of Inheritance we have seen till yet, Multiple Inheritance. 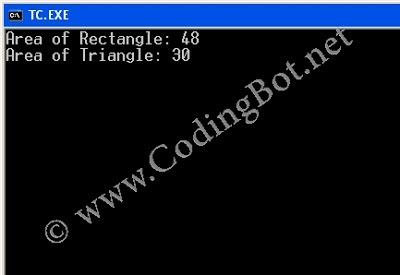 A class can inherit the attributes of two or more classes as shown in fig. A. This is known as Multiple Inheritance. Multiple Inheritance allows us to combine the features of several existing classes as a starting point for defining new classes. It is like a child inheriting the physical features of one parent and the intelligence of the another. where, visibility modes may be either public or private. The base classes are separated by commas. The following program shows the program code illustrating how all the three classes are implemented in Multiple Inheritance mode. We have discussed in my previous post, what is Inheritance and its different types in C++, so today we are going to discuss about its fourth type, that is, Hybrid Inheritance. There could be situations where we need to apply two or more types of inheritance to design a program. For example, consider the case of processing the student results. Assume that we have to give weight-age for sports before finalizing the results. The weight-age for sports is stored in a separate class called sports. In this case, we will need both Multiple and Multilevel Inheritance. Consider another case, where all three kinds of inheritance, namely, Multilevel Multiple and Hierarchical Inheritance, are needed. This is illustrated in the following picture. The 'child' has two direct base classes 'parent1' and 'parent2' which themselves have a common base class 'grandparent'. The child inherits from 'grandparent' via two separate paths. It can also inherit directly as shown by the red line. The 'grandparent' is sometimes known as the Indirect Base Class. Inheritance by the above method directly might pose some problems. All the public and protected members of 'grandparent' are inherited into 'child' twice, first via 'parent1' and second via 'parent2'. This means child would have duplicate sets of members inherited from 'grandparents'. This introduces ambiguity and should be avoided. Hence we use a method called virtual base class. C++ takes necessary care to see that only one copy of that class is inherited, regardless of how many inheritance paths exist between the virtual class and derived class. 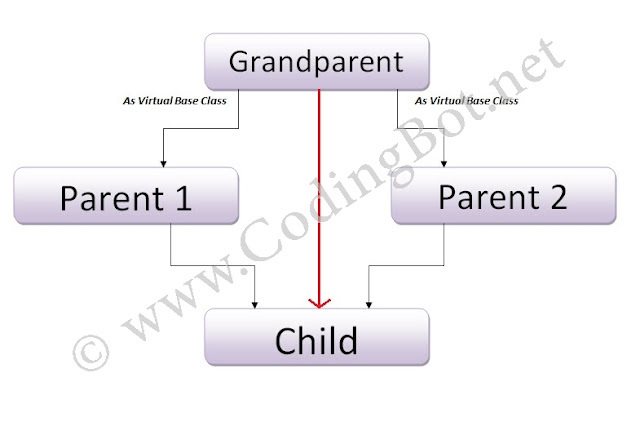 We have discussed in my previous post, what is Inheritance and its different types in C++, so today we are going to discuss about its third type, that is, Hierarchical Inheritance. So in Hierarchical Inheritance, we have 1 Parent Class and Multiple Child Classes, as shown in the pictorial representation given on this page, Inheritance. Many programming problems can be cast into a hierarchy where certain features of one level are shared by many others below that level. One example could be classification of accounts in a commercial bank or classification of students in a university. In C++, such problems can be easily converted into hierarchies. The base class will include all the features that are common to the subclasses. A subclass can be constructed by inheriting the properties of the base class. A subclass can serve as a base class for the lower level classes and so on.